Thus was Dolly Granatelli’s first impression of her late husband, Andy, when meeting him on a trip to Chicago. For everyone in his life, and nearly everyone in the world of auto racing, Andy Granatelli was a larger- than-life presence. 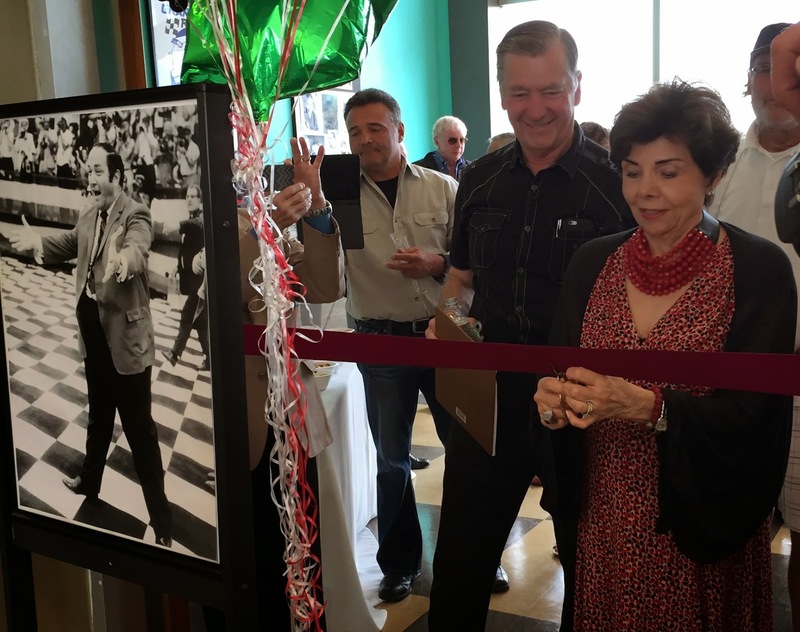 On Sunday, March 15, the Murphy Museum in Oxnard opened its “Mister 500” tribute to Andy, which houses memorabilia from the collection of his son, Vince. You can see the exhibit every weekend with admission to the Murphy (www.murphyautomuseum.org/). It turned out that Andy was no longer married, and the night after her first encounter with him, Dolly recalls, he took her and her family out to dinner. “Before we even got the menu, he picked up my hand from my lap...and told my dad, ‘I’m going to marry your daughter.’” In response, Dolly just giggled, but she had already fallen in love at first sight. Andy may have been an imposing figure, but he was also a positive and energizing one. Describing her husband, Dolly uses terms like “powerful” and “all over the place.” But her smile really comes through when talking about his love and affection. A big believer in karma, I suggested. “He started it,” replied Dolly. Andy was born in Dallas, but his family moved to Chicago when he was young. He opened an auto service shop with his brothers Joe and Vince. Andy’s Super Service – their name would be first in the phonebook – set themselves apart by doing pit-stop-style maintenance, with four or five mechanics wrenching at a time. Andy parlayed the success of the shop to create Grancor, with performance parts for the burgeoning hot rod scene. His business acumen was undeniable, as he was one of the first to recognize the opportunity for branded, consistent performance upgrades. The next year, in 1946, Andy took his first car to the Indianapolis 500, which kicked off a life-long obsession with the event. In fact, Andy attended every single Indy 500 event from ’46 until 2012, reinforcing his “Mr. 500” moniker. Even as he focused on winning Indy, he had time to create a tremendous business legacy. He and his brother, Joe, had purchased Paxton Products, from which they had been buying superchargers, and Andy managed to rescue the company from failure in a mere seven months. The company was acquired by Studebaker, which then asked Andy to rescue their floundering Chemical Compounds division, which made STP oil additive. He proceeded to create a marketing plan that revolutionized the way brands could be promoted, and cemented the new STP logo as one of the most recognized in history, becoming a symbol of speed and excitement. During this time, Andy’s mind was still focused on racing, and getting back to the Indy 500. He returned in 1967 with a car he had built with Ken Wallis with a turbine engine and all-wheel drive. The car, driven by Parnelli Jones, led for most of the race, but the failure of a six-dollar transmission bearing sank the car with just three laps to go. The following year, his Lotus racecar was also leading the race when it broke down just ten laps before the checkered flag. But in 1969, despite driving a year-old backup car and recovering from burns from the crash of the main car in a practice session, Mario Andretti sealed the deal for Andy. This spurred the iconic photo of Andy’s big, fat kiss on Andretti’s cheek in Victory Lane – before the Queen of the 500 Festival could get to him. He continued his involvement in racing until 1973, but would go on to attend the Indy 500 as a major presence every year. It would even be part of his philanthropic efforts. Andy would often donate packages to fundraisers that would give the winning bidder the opportunity to join him at the race. He would regularly draw in bids of more than $50,000 for the package. His charitable endeavors were manifold. In 1982, Andy helped to found the 11-99 Foundation to benefit CHP officers and their families. He also served as chairman of the Santa Barbara County Sheriff’s Council and was a big supporter of the Police Activities League. His affinity for police organizations began with his good friend Bob Weinberg, with whom he started the 11-99 Foundation. “He saw how successful that was,” and realized the big impact he could make for the law enforcement community, said his son, Vince. Andy was a relentless crusader for those causes, which perhaps helped to sustain his vitality. He was nearly 91 years old when he passed away at the end of 2013. “Two days before he died, he was working at his desk,” proclaimed Dolly. With his outsized impact of both his sport of choice and the people around him, Andy was honored many times. Most prominently, he was inducted into the International Motorsports Hall of Fame in 1992, and the Motorsports Hall of Fame of America in 2001. The Indianapolis Motor Speedway Museum will also be honoring Andy with an exhibit, but that is still under construction, so you can get your Granatelli fix at the Murphy in the interim. The exhibit features photos, memorabilia, and even clothing from the family collection, some of it displayed publicly for the first time. The Murphy exhibit also has a sharper focus on Andy’s life on the Central Coast. You can see the exhibit along with the rest of the Murphy’s wonderful cars, some of which will be highlight- ed in the Santa Barbara Sentinel this weekend. And if you visit for Andy, your admission donation to support the museum can help his karmic legacy continue to grow.